I mentioned before that Autumn Hope and her mate, previously our Magnificent Mile pair, have renested in the River Birds territory on the London Guarantee building. 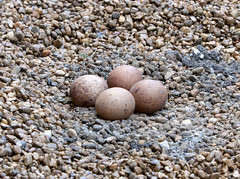 On May 25th, Mary and I went to the London Guarantee to check things out and found Autumn Hope sitting on two eggs. Today, Mary, Matt and I went back to the LG to spiff Autumn Hope and mate’s nest ledge with some some pea gravel. I was really hoping that the mate would come in so I could get leg bands, but, sadly, that didn’t happen. We DID see the fierce and furious Autumn Hope and four, yes – four – eggs. Matt and Mary spread a nice layer of gravel under her watchful gaze and laid all four eggs right in the center. This is the first real renest I’ve seen. Mary and Matt have seen a few and I’ve read about late, successful renests in Michigan and Wisconsin. ~ by Steph on June 3, 2010.